The International Sail Training and Tall Ships Conference 2018 in Seville included the Annual Awards ceremony where prizes were presented for significant achievement in Sail Training to a diverse and international group of people, including vessels operators and host ports – who have all made the sail training world a better place. The Best Newcomer award goes to the vessel, that in the opinion of the Race Management Team, volunteers and directors and Trustees, made an outstanding contribution to their first Tall Ships Race or Regatta. Bima Suci made a spectacular international debut during the SCF Far East Tall Ships Regatta 2018. Her Captain and crew exemplified the spirit of the Tall Ships Races, namely international understanding and friendship and were a credit to their navy both racing at sea and throughout the shore programmes. Awarded to the vessel that in the opinion of the Race Management Team, volunteers and directors and Trustees, has shown great loyalty towards The Tall Ships Races over many years. This award was presented to Maybe, a vessel that took part in the first international Tall Ships Race in 1956 and is one of the few vessels that is still competing. Her present owners are passionate about their vessels and have spent an immense amount of time, effort and expertise in restoring her to her former glory which has enabled her to enter the Tall Ships Races every year since 2007. Awarded to a sail training volunteer under 25 to encourage high-performing individuals who deliver sail training to young people. Janice Fleming was nominated as Young Sail Training Volunteer of the Year by the Atyla Foundation. She has demonstrated motivation and initiative throughout her entire time on board the vessel. She has shown strength and patience during rough times, and has always stayed cheerful. She has always given her best during lesson times, and takes pride in her sailing skills, as well as being a great example during coaching sessions which are part of the project. Awarded to a professional young sail trainer to encourage high-performing individuals who deliver sail training to young people. Peta Koczy has been sailing full-time since she was 17, initially with Ocean Youth Trust Scotland where she became a First Mate and also qualified as an RYA Yachtmaster Instructor before joining Ocean Youth Trust South in 2016 to help bring “Prolific” into service and train the volunteers in how to sail a much larger and more complex vessel. A year later she was promoted to Staff Skipper and she has received exceptional feedback from clients and young people during her first year and has been complimented by experts on everything from boat handling to youth work. Awarded to a professional sail trainer over 25 to encourage high-performing individuals who deliver sail training to young people. Jan-Willem Ouwerkerk started sailing on Eendracht (Netherlands) in 2004 as a trainee and in 2006 the vessel’s crew suggested he become a volunteer Watch Leader. That was the start of his professional maritime career and now, in return, he gives presentations for Maritime universities and also organises voyages with disadvantaged youth, ex-homeless, the sick and the elderly. He has sailed many training voyages, day trips and Tall Ships Races and this year he had his first journey in the Tall Ships Races as Captain of a Class A vessel – he is the perfect example of what The Tall Ships Races stand for and a prime example of this was Eendracht winning the Friendship Trophy this year. He is a great example of hard work, taking chances and finally growing to become a captain. He is the youngest master ever to command Eendracht. Awarded to a sail training volunteer to encourage high-performing individuals who deliver sail training to young people. Peter Graham is Leeuwin Ocean Adventure’s oldest sailing volunteer. He joined ST Leeuwin (Australia) in 2008, and since then he has completed 93 voyages. This most recent one will be his last in the Watch Leader role, with his ongoing contribution being a newly-created role – that of “Watch Leader Whisperer” – developing and encouraging a new generation of young leaders within the organisation. His patience, calmness, empathy and ability to ensure each trainee gains the absolute most from their sail training experience has been demonstrated time and again. He looks forward to continuing his role in having a significant impact on the development and lives of young people. Find out more about Peta’s exceptional work with Ocean Youth Trust South in their coverage of the awards. The three-masted barque Picton Castle (Cook Islands) is best known for her extended deep water sail training voyages and is currently sailing on her seventh trip around the world. She has operated as a sail training vessel since 1996 and in that time more than 2,000 people aged 15-85 from over 20 countries have sailed as trainee crew, covering over 300,000 nautical miles. Her sail training programme has launched the careers of hundreds of capable, sought-after mariners at sea today, enriched the professional standing of many more and passed on skills of the true mariners from the Great Age of Sail to a new generation. This award goes to the host port in 2018 that did most to recruit trainees through their sail training programme. Harlingen broke new ground in 2014 by developing a visionary trainee programme, with the leadership of their Maritime College and support of their tight-knit community. In 2018 they recruited nearly 350 trainees to take part in the Tall Ships Races. Awarded to the ship which, at any time between 1 October and 30 September, covers the greatest distance in any period of 124 hours, which is 5 days and 4 hours with a sail training crew on board. This year the Boston Teapot Trophy has been awarded to Statsraad Lehmkuhl after sailing 1,254 nautical miles. The story of the Boston Teapot started in 1964, after the transatlantic Tall Ships’ Race to America. Two vessels were sailing back from Boston to Europe, and one of them would benefit financially from their sponsors if she were taking part in a race, or other competition. It was decided that some form of trophy should be awarded for the fastest passage, greatest noon to noon run, or other feat and it was decided that the trophy should be called “The Boston Teapot”. This prestigious trophy has been awarded ever since to the vessel that sailed the greatest distance within 124hrs with a sail training crew aboard. Sailing has always been an integral part of Gunars Steinerts’ life and in 1997 he decided to purchase a legendary Polish sailing yacht, Spaniel, to participate in The Tall Ships Races. He has always wanted to pass on his passion for sailing and knowledge to young people, and more than 500 trainees of different ages and backgrounds have gained their first sailing experience or increased their skills on this single sailing training yacht in Latvia. Many of them have decided not to leave this boat any more and the crew of Spaniel have become an unofficial club of more than 100 people, managed by STA Latvia. Despite being over 80, Gunars continues teaching new sailors and skippers. After his initiative, a special skipper’s training course was developed by STA Latvia, and he is still the organiser and manager of these courses – each year between 10 and 20 young men and women obtain their first sailing licences because of this programme. 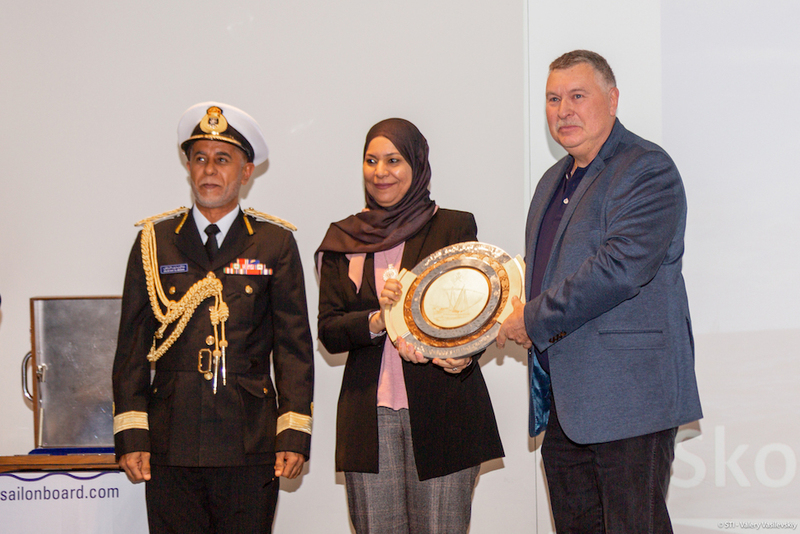 The Sultan Qaboos Sail Training Trophy went to Skonnerten Jylland (Denmark), a Tall Ship that sails with young people who all have social problems and who have been at odds with the law and are in danger of ending up in jail. Through sailing training and life at sea the goal is to show the young person another and more constructive way in life. Through responsibilities and experiences as participating in the Tall Ships Races, the youngsters perceive themselves as being part of the maritime sailing ship’s environment and achieving a high degree of self-esteem. Through the maritime environment, experiences at sea, participation in Tall Ships Races and school education, it succeeds in showing young people a way out of drug abuse and the criminal environment. This organisation receives youngsters from the street, young offenders’ institutes and other institutions. The organisation was founded in 1997 by their visionary skipper and has since had more than 80 young students aged 15 to 25 first with their vessels.